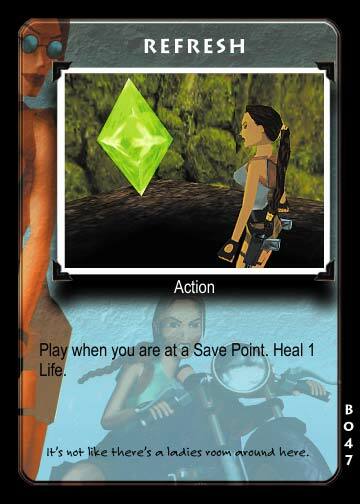 This collectible card game is set in the Tomb Raider universe. 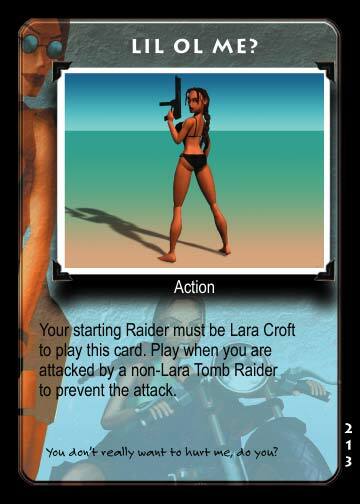 In Tomb Raider Collectible Card Game, you take the role of Lara Croft or one of her rival Tomb Raiders. You may explore a tomb or cave, or face some other mysterious and dangerous quest. During the game you will fight wild animals, defeat traps and overcome many other obstacles to find the level’s treasure and win the game ! 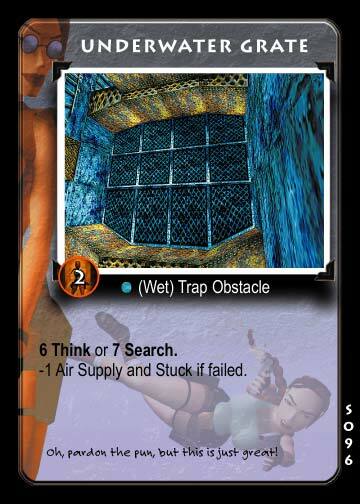 Tomb Raider is a collectible card game for two or more competing raiders. 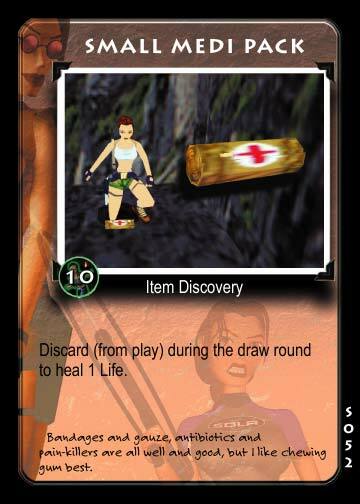 Each player who plans to compete for the treasure needs her own deck of Tomb Raider cards. Your group will also need several six-sided dice, plastic figures to represent your raiders and the various tokens included with each quest deck. Use coins or other tokens to represent additional Tomb Raiders if there are not enough different Lara figures for all of you. 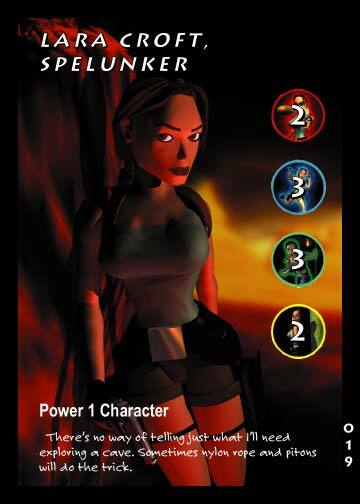 Tomb Raider can also be played by a single player. Precedence Entertainment has officially sold out of the Tomb Raider series as of the GAMA 2001 Trade Show. 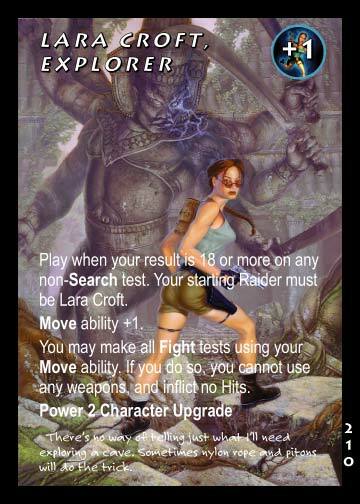 Due to production and licensing issues, we are currently unable to progress any further with more expansions to the Tomb Raider CCG line. This has resulted in Precedence having to make the hard decision that we must discontinue further expansions for the Tomb Raider CCG. This will also result in having to pull active tournament and demonstration support for the game beyond that which is already scheduled. We will continue to have the website up and running with Tomb Raider information, rules updates, galleries, email and phone support for players, etc. This was a hard decision to make for Precedence. 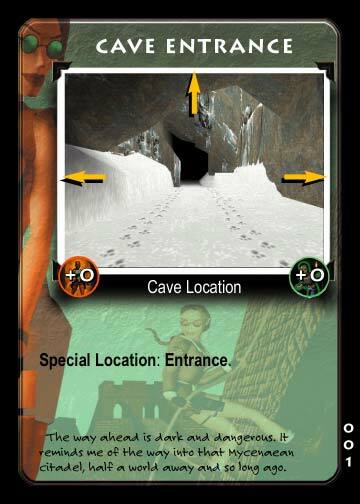 Overall Tomb Raider has done fairly well and is one of the more talked about CCG's in the industry. However, without approvals in on some of the newer video game releases in the series and no license for imagery from the movie, we have found it increasingly difficult to come up with enough unique imagery to put together a cohesively themed expansion. Most of these problems fall in the range of the Action Cards. How many different ways can one show a picture of Lara running down a hall and make a different action out of it? This leads us to either needing many more artists, or obtaining custom imagery outside the scope of the existing video game releases that we have approval to work with at this time. Either way this would serve to push the cost of the product up quite higher than it has been, and we cannot in good conscience, ask our retailers and consumers to carry that cost for us. 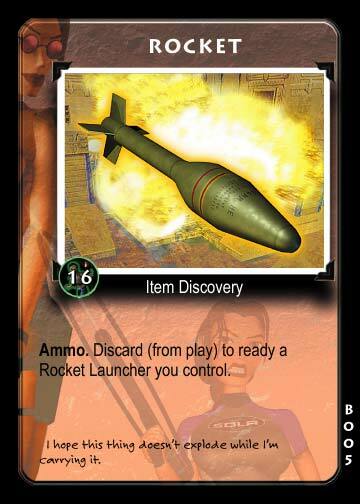 We also face the problem of potentially having to reprint older materials for new players. This will unfortunately devalue the existing cards, unless we make cosmetic changes to each card to make them slightly different, and we know that is not what our collectors will want. We also would then risk having a large quantity of product when our license expires, and not being necessarily able to still distribute it. Therefore we have had to make this very hard decision. We had hoped that we would have enough support product remaining to reach this year's Western and Eastern Hemisphere Championships, but that will not happen without having to turn away already scheduled and requested support from both retailers and our "Raider" Prec-Reps. This we will not do. Again, we will continue standard support, and you will not see the Tomb Raider area of this website fade away, it will continue on, we will take support questions, keep enough stock for the occasional damaged card that comes out of a pack, and we will stay here to assist players and collectors with their Tomb Raider product. We know that even though we are out of sellable stock, distributors and retailers are not, and even when they are, then our labour of love sits in the hands of the players and collectors around the world, and supporting them is an utmost priority in this new millennium. As a final way of saying thank you, we are placing all the new promotional cards from the game that were not given a chance to find standard release, up for sale at our online store. Though we have very limited quantities, we will add what we have to the promotional card order form that will appear at the online store in early-mid April, so that you can complete your collections as easily as possible. We thank you all for your support, we hope you continue to enjoy the Tomb Raider product line (as well as our other series), and love playing and collecting it as much as we loved making it.